This hike has so many of the things I like on a hike; great views of Lake Superior, access to shoreline, abandoned mine, old buildings. The navigation is a bit tricky once the flagging tape ends, so as always, have a map and compass and make sure you know how to use them to find your way. From Sault Ste. Marie drive north on highway 17 for 100km. Just past Alona Bay there is a gated gravel pit on the lakeside of the road. Park off the road near, but not blocking the gate. From the parking spot hike across the gravel pit toward the lake and find an old paved road heading north. Follow this road and the orange flagging tape. After 1km you will start heading slightly west up a steep incline. 300m from the top of the steep incline look for the trail to the lookout on your left. I don’t think it is marked. Return to the flagged trail after visiting the lookout. At just about the 2.5 km mark the flagging tape runs out. From here follow the gully, slightly to the north, that used to be the old mine road. Follow this gully all the way to the shoreline where you will find the old mining structures. 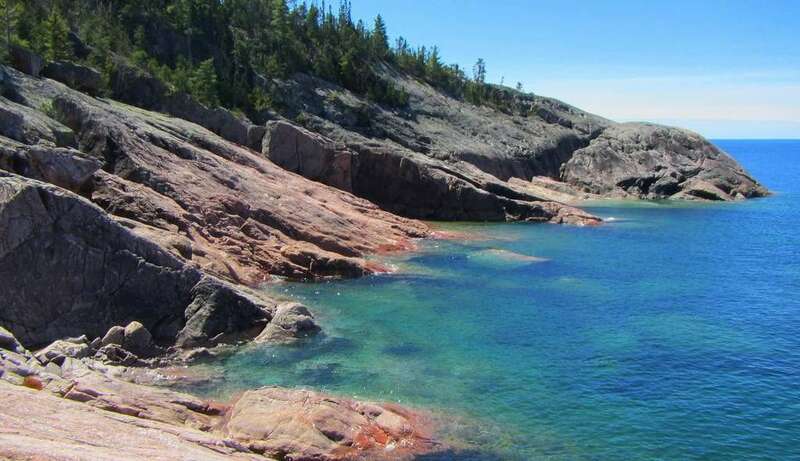 There is a gorgeous shoreline to explore here, I especially liked the sloping rocks to the south of the mine area. Return to the parking spot the way you came in.